I'm going to be completely transparent with you for a moment. I really struggle with side dishes. One pot meals, no problem. Entrees, all day long. But side dishes, yeah I have a hard time with them. Since I've been trying to eat cleaner, I'm finding that sometimes the most simple ingredients can make the best accompaniment to my meals, and cheese truly makes everything better. Don't believe me? Check out my Roasted Parmesan Carrots. While the oven is preheating you will peel the carrots. Once the carrots are peeled, cut them in half through the middle. After that, cut each section in half, lengthwise. Place the peeled and cut carrots onto a foil-lined baking sheet ( I like the Nordic Ware ones). Then drizzle the extra virgin olive oil over the carrots, sprinkle the minced garlic over everything, and season with salt and pepper. 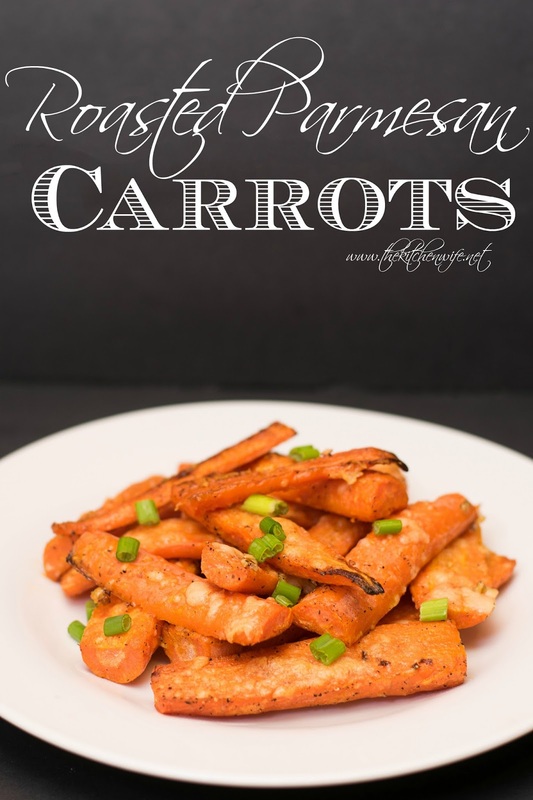 Place the carrots into the preheated oven and cook for 15 minutes. After 15 minutes remove the carrots from the oven and turn over. Sprinkle the freshly grated parmesan over the roasted carrots and return to the oven to cook for 10-15 more minutes. And yes, before you ask, you MUST use freshly grated parmesan. The powder stuff will not work here. And there you have it, Roasted Parmesan Carrots! All of the sudden this humble root vegetable has been transformed into something stunning, that you can be proud to put on any plate. The natural sweetness from the carrots, savoriness from the roasting, and tanginess from the parmesan cheese give this side dish a flavor that is out of this world. And hey, kids love veggies that are colorful and covered in cheese, right? They pair perfectly with my Crock Pot Garlic and Rosemary Roast Beef or my Lemon Pepper Chicken. So if you're struggling with what to serve alongside your entree tonight, worry no more, get in the kitchen and give these Roasted Parmesan Carrots a try tonight! Cut the carrots in half, through the middle. Then, cut each half in half, lengthwise. Place the carrots onto a foil lined baking sheet. Drizzle the extra virgin olive oil over everything, sprinkle with garlic, and season with salt and pepper. Place into the oven and cook for 15 minutes. 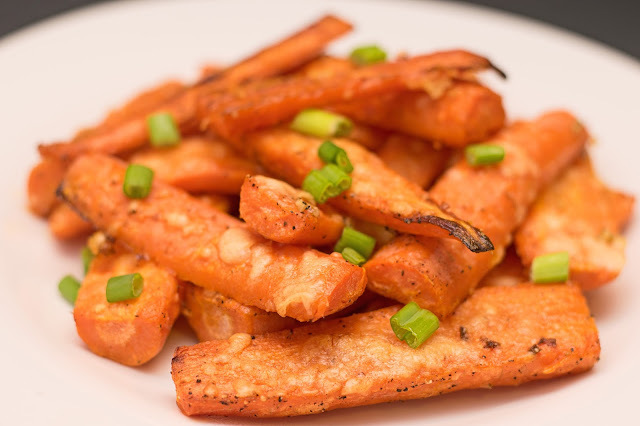 After 15 minutes, remove the carrots from the oven, turn over, and sprinkle with the freshly grated parmesan. Return to the oven and cook for 10-15 more minutes. Hey Rosie! Thanks so much for stopping by and from cooking from the blog! I'm so glad you loved the soup! It really makes my heart happy to hear stuff like this. I'm also glad you all are getting some much needed rain in California! These look wonderful. I started roasting carrots last summer and the flavor is so delicious. I drizzle honey over ours. I will be doing his recipe for sure. You are so right that everything is better with cheese on it. Thanks for the recipe. Oooooo....I LOVE the honey idea! And roasted vegetables are THE BEST!